Second Scoop Frozen News: Baskin-Robbins Sweetens February with Introduction of Valentine's Day Ice Cream Cake Bites and "Box of Chocolates"
Baskin-Robbins Sweetens February with Introduction of Valentine's Day Ice Cream Cake Bites and "Box of Chocolates"
CANTON, Mass., Jan. 31, 2012 /PRNewswire/ -- Baskin-Robbins, the world's largest chain of ice cream specialty shops, is making Valentine's Day even sweeter this February with the introduction of two new flavors to its popular line of Ice Cream Cake Bites, the brand's delicious culinary creation that combines both ice cream and cake into a single, bite-sized serving. The new flavors, available for a limited time only through the end of February, are Love Potion #31 and Chocolate Dipped Strawberry. Baskin-Robbins' Ice Cream Cake Bites feature ice cream with an indulgent ganache-style covering and are finished with a decorative drizzle of chocolate, caramel, raspberry or strawberry. The first new Ice Cream Cake Bite includes Love Potion #31 ice cream resting over rich chocolate cake, covered in a chocolate-flavored coating and finished with a raspberry-flavored chocolate drizzle. The Chocolate Dipped Strawberry Ice Cream Cake Bite is made with Very Berry Strawberry ice cream over chocolate cake, covered in a chocolate-flavored coating and finished with a strawberry glaze drizzle and mini chocolate hearts. The addition of Love Potion #31 and Chocolate Dipped Strawberry marks the first time Baskin-Robbins has introduced new Ice Cream Cake Bites flavors since they first launched in October 2011. "We are excited to offer more indulgent flavors as part of our line of Ice Cream Cake Bites just in time to celebrate Valentine's Day," said Stan Frankenthaler, Baskin-Robbins Executive Chef and Vice President of Innovation at Dunkin' Brands. 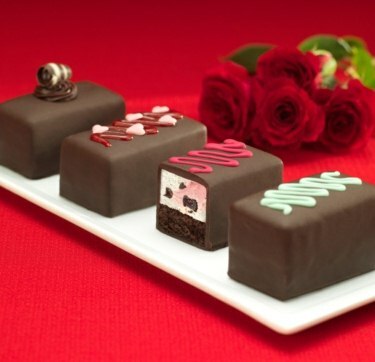 "Our Valentine's Day Ice Cream Cake Bites 'Box of Chocolates' provides our guests an elegant dessert option that is the perfect gift for that special someone or to share with a group." Now available at participating Baskin-Robbins stores nationwide, guests can purchase Baskin-Robbins Ice Cream Cake Bites individually for a suggested retail price of $2.99 and in mix-n-match four-packs, including in a special Valentine's Day "Box of Chocolates," for a suggested retail price of $9.99.